Nasa would surely approve us bringing back the old and making it new again with this mid-century modern space pattern. Chock-full of retro blue, orange, yellow and green who wouldn't or couldn't design around this pattern? 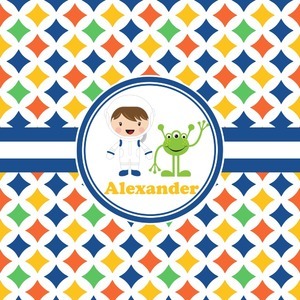 A white wide band trimmed in coordinating blue breaks up the pattern and showcases your little space guy with his martian buddy. Add personalization of your choice for that special touch.